I’ve been on the road, more or less continually, for a year and a half now. In this period, the world roads led me not only to Rome (like roads tend to), but also to the wide range of animals. The world (well, what was left of it, at least) felt abundant with life! Elephants and hyenas, wild boars and orphaned owls, monkeys and crocodiles, flocks of various birds and hordes of deer let me in their hoods. I enjoyed the role of the wildlife whisperer, as maybe it was easier to pretend I understood animals better than humans. Better than myself. It also seemed like being closer to living life with full lungs. While my world traveling led me to a surprisingly low number of stray dogs, a remarkably large number of cats crossed my path. I am really not a cat person, yet meeting them made me reflect a lot. About life. Even if my original intentions, when I was leaving Croatia for Vietnam in February 2017, were to provide a funeral for my walking stick pet, it was just a part of the truth. Or a version of the truth. I also left because of myself. At that moment, I might not have been aware of that entirely yet, but “following your path” decision turned out to be my therapy. Here is the newest (and probably not the last) part of my story. For thirteen years, I’ve been working in the Croatian cultural production sector, in a highly underdeveloped artistic field. The extreme rhythm of work that often did not know for daily rest, weekends or even yearly holidays, took its toll. Already after five years of pushing that Sisyphus’ boulder up the never-ending hill, I knew this was not a healthy habit, and it needed to stop. Yet, as in Sisyphus’ myth, my self-inflicted punishment seemed eternal. I extended my masochism for the additional eight years! Leaving the loop of raising funds, preparing and executing the production, evaluating and reporting, and doing it all for dozens of projects set in a domino-tiles sequence, seemed impossible. Cats, like this one in Harar, Ethiopia, can keep it cool in seemingly most stressful situations! While neglecting most of the things that make life humane, my body was sending me signals in the process. Signals said this ain’t good. Skin changes, bleeding teeth, some strange lump on my head I needed to have removed. Various doctors were finding the origin of my health problems in the same cause: stress. I always considered myself a generally healthy person. If nothing else, life was proving my resistance. I was rarely visiting doctors. I was rarely taking medications. Surviving my aches without painkillers became the norm. Doctors told me I was allergic to some parts of the drugs. I should’ve gone to the hospital for a week to find out what it was, but you guessed my answer! I never had a spare week in a timeframe of a year to focus on this. Did I just call myself “this”? Instead, I’ve learned to live with pain. I was ok with it. My threshold for pain moved up. When I had my eyes operated for laser diopter removal, I shocked the doctor who provided a horse-power pill to help me when the local anesthetics wear off. “I don’t take painkillers”, I said. “Believe me; you will want this one! Everyone feels pain after this kind of surgery!”, they responded. And there I was at home, with the pill intact. Defying all the odds, I didn’t feel a thing. Like with all things in life, ignoring things would not make them go away. Even if one made the body (or mind) handle pain more easily, it didn’t mean that issues disappeared, as in a magic trick. It is very childish to put palms over your eyes and think that then nobody could see you. One day I found a lump in my testicle. I was appointed for a special ultrasound checkup in the hospital so that testicular cancer could be excluded. The doctors scheduled my exam during the biggest edition of the festival I’ve ever organized. In the middle of the two weeks of performances from around the world (seven of which were co-produced by the organization I led), they were expecting me to leave everything and take care of this. Did I just call myself “this” again? Of course, I’ve skipped my hospital appointment! In my crazy set of priorities, the feeling of responsibility for the artists coming from eleven countries, and the feeling of guilt for the impatient audiences in front of the theater doors, swallowed everything else. One thing did not let me just snooze off my screaming alarm clock! My colleague, the backbone of the festival’s technical execution, got diagnosed with leukemia. 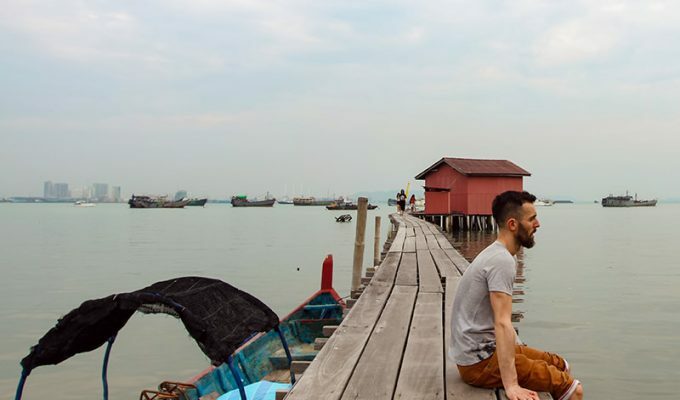 While the whole cultural scene of Croatia united in the search for the donor of the marrowbone that would save my colleague’s life, I was running the crazily over-ambitious festival and ignoring my lump as if it would miraculously disappear. I instantly knew how wrong I was. The efficiency of the pressure we feel when confronted with the expectations of the environment shocked me. In the middle of the festival, I decided to detach myself from this artificial beast that was slowly draining the life out of me. 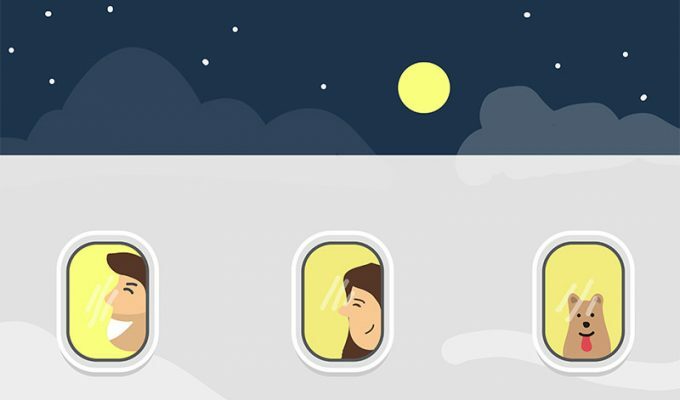 One night, I’ve bought the most unusual flight ticket in my life! You can read about this episode in the article Affording a Getaway: Traveling Saved Me From Going Crazy. In the following months, my colleague got the marrowbone transplant! Soon I managed to go through my medical exam as well, and it removed the suspicion of the worst case scenario. At the same time, I knew I had to be far enough from the siren call of the projects I could have continued otherwise while restoring the delusional belief in one’s superpowers. 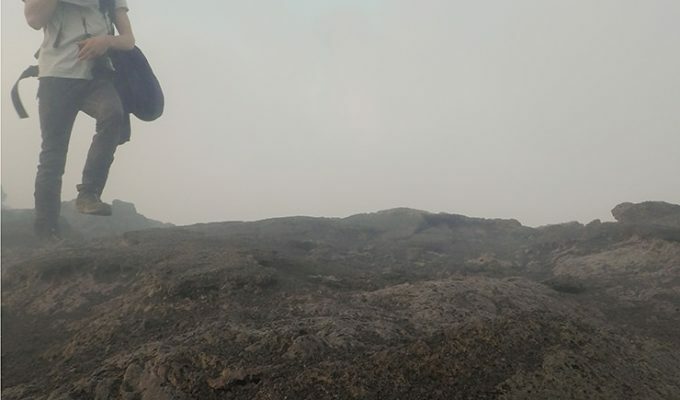 I had to be far away to be able to cut the cord with my real tumor – being a workaholic in a toxic environment. I needed to dig out the embedded belief that all of this mattered more than my own life. So what cats got to do with it? It was July 2017. I’ve finished my visit to Tanah Lot Temple in Bali and was waiting for a Grab Car to pick me up and bring me back to Kuta, where I was staying. From the garbage pile disposed just next to the road, one cardboard box seemed alive. I couldn’t ignore the loud meowing. 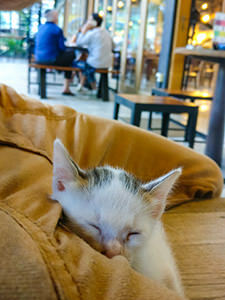 And soon, there were two of us in the car: a scared kitten disposed in the trash and me saving it, even if I was leaving Indonesia the next day. I stopped the car at the Livingstone cake shop (go try out their cakes, they were a treat in every way! ), and got lucky. The shop captain Ani adopted Zara, the card box kitten! 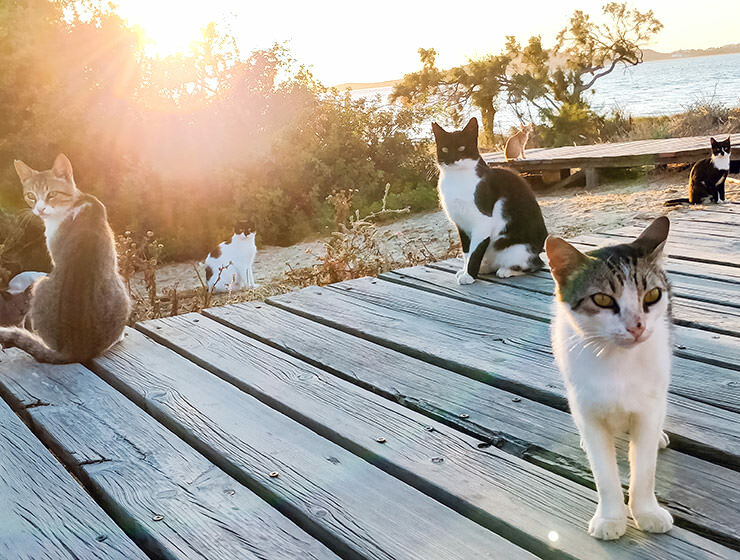 In May 2018, as soon as I set foot on the island of Syros in Greece, I’ve realized the place was overpopulated with cats. They were jumping out of every garbage bin, lurking behind every corner. 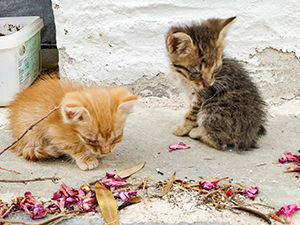 Two recently abandoned kittens were meowing next to the peaceful Achladi Beach. Judging by their eyelids being stuck shut, these cats were new-born. Following each other’s meowing over the road, one has already dropped from the staircase leading to the rocks and certain death. Again, it was not possible to be ignorant and just leave them to chance. This strikes the most: I don’t even like cats! Yet, it seemed that, while moving around the world, I couldn’t stop saving them. I couldn’t ignore the fragility of these abandoned beings, and their loud cry for help. Was there anything I could learn from this? Cats have nine lives; we don’t! In Thessaloniki, the kitten called Coralia ended up suckling on my skin in search for the mother that abandoned it. The little cat boy found the least likely cat-person in sight, and decided I should be the breastfeeding stepmother for the time being. 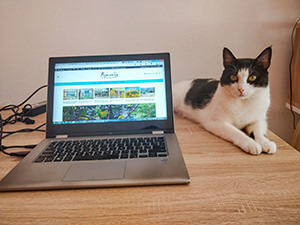 While I am writing this, I am in Split, Croatia, and Špiro the cat is nestling around my laptop, balancing on the edge of the table. Her daughter Lulu cuddles around my legs while I try to gather my thoughts. Cats offer and demand attention. But they can easily survive without us. The old proverb says that cats have nine lives. They are strong and independent beings. 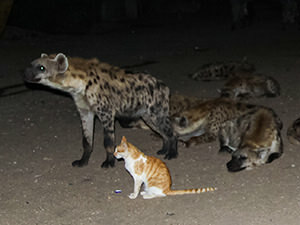 In Ethiopia, I saw cats feeding next to hyenas. They are fearless. Unlike most of us. Playing a stepmother to an abandoned Greek kitten made me delve deep inside myself and rebuild the confidence in what I’m doing at the moment. For more than a decade, I was prioritizing work, and procrastinating on everything that was personal, including health. And yet, we are not cats. We don’t have nine lives. We have one (proven) chance to live our lives the best way we can. Sure, we can always justify putting ourselves in the second plan because we are needed. We can do it while taking care of animals, businesses, families. But at the end of the day, if we are indeed so needed and so irreplaceable, it is because we are efficiently fulfilling the expected role. We are of no use to anyone if ignoring our own self pulls our efficiency down, jeopardizing our health and bringing us to the edge of the cliff. Follow your path today! 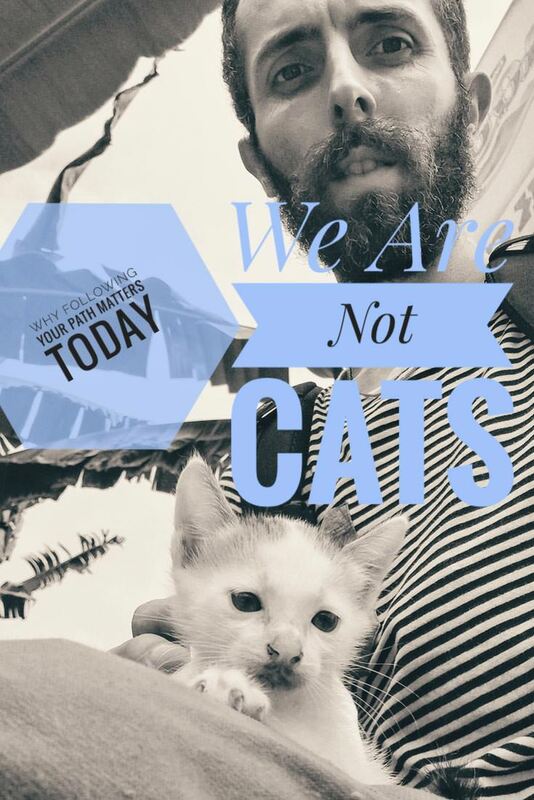 After all, we are not cats. Thanks for sharing! I, myself, am a big kitty fan, but am really, really bad at taking proper care of myself. This is a great reminder. Thanks, Jordan! I really think we should all take care of ourselves at least as much as we care about others! Ivan, I think your last paragraph resumes everything very well. I have never been the kind of person who takes myself to the limit with respect to work and stress. Yes, there have been instances where I have worked under extreme pressure, moments where I have wanted to cry at work and moments where I feel like quitting work right away but I have been able to deal with those situations. I think having strong relationships and time to do things you like help. Unfortunately, I have coworkers who take things to the extreme and have seen the turning into miserable and sick people. For some of them, I have tried to be the voice of reason but I think many people wait to reach the bottom (which may be too late) to make a change. I am glad you have found a way to get out from where you were. Thanks for your thoughts, Ruth! It is true, everyone has a slightly different mechanism of coping with stress. As long as the mechanism works, our bodies and minds are capable of recovery. Ignoring their wake-up calls though is when the problems start. Surrounding oneself with strong relationships and doing things we love is a great tip for making those times less troublesome. I hope everyone in such a situation will find the courage and inner strength to turn things around.